I’ve been really good about keeping my life’s problems to myself, so you probably had no idea how difficult the past five years have been. Typical of most men, I lowered my head and pushed forward stubbornly refusing to reach out for help. I became withdrawn, depressed, overweight, fatigued, and was plagued with a plethora of seemingly unrelated health problems and random pains in my abdomen and chest radiating to my arms and fingertips. I knew something was wrong, very wrong, but my doctors told me I was young and healthy. They asked if I was stressed. I told them, “of course.” They said I needed to lose weight. I told them, “duh,” and tried to explain how active I was with volleyball, photography, travel, and how I walked my Labrador Retriever regularly. They nodded and smiled. My journey has been fraught with doubt and disbelief. No one believed I was sick. I put on a happy face and went on with life feeling a little worse each day. I went to the doctor five years ago complaining of pain in my chest. She ordered the regular tests to check heart and lungs. She also gave me an inhaler and ordered a series of allergy tests. I learned I was allergic to dust mites (who isn’t?) and bought a new mattress, covered it with a special hypo-allergenic case, and filled my rooms with hepa-filters. A year later, I went back complaining of the same pain and also generalized fatigue. I required a nap every day and was sometimes too tired to leave the house. No amount of sleep helped. Still I went to work and continued to coach volleyball several nights a week. I went on with life, trying all the while to hide how bad I felt on a regular basis. I kept telling myself that I would feel better if only I was in better shape. This is what my doctor had said after all. Another year passed before I changed doctors and presented my symptoms again. By this time I had added fifteen pounds and persistent dark circles under my eyes. On the worst of days, people would actually ask if I had been in a fight, so discolored was my skin. I would wake in the morning and tell myself I needed to change the lights in the bathroom because they were so unflattering. My doctor ordered a sleep study. I spent the night wired up and was told I was had chronic sinusitis and a mild case of sleep apnea. They gave me a c-pap machine to help me breathe at night and prescriptions to help with the sinus issues. Finally, a diagnosis, I thought. Depression was the next symptom. I found myself withdrawing from my friends, short tempered, stressed, and focusing on negative thoughts. I was becoming more and more frustrated with the fact that there seemed nothing I could do to change the way I was feeling. Here is when I should have reached out for help. But I couldn’t. I wouldn’t. If only I had known that depression was a common symptom of the soon to be diagnosed disease. Another year came and went and my symptoms increased in severity and frequency. Add shortness of breath, dizziness, and an irregular heartbeat to the mix, and I was sure my heart was the problem. A blocked artery would explain the fatigue, shortness of breath, and sharp pains in my chest and left shoulder. I went to the emergency room and came home with a normal EKG. I was told I was having a panic attack. Then I had an episode in Paris where I was staying for the summer and sought out a British doctor. He said the same as the others – I was healthy, but also suggested that it could be an ulcer. He gave me the equivalent to Nexium to get me through the summer. Back home, sharp pains in my chest again sent me to the hospital and an x-ray, MRI and ultrasound were ordered. I also had a tube stuck down my nose clear to my stomach (worst test ever) to check my esophagus and then a separate GI endoscopy later. Esophagus negative. Yes on gastritis (pretty common). Then the ultrasound came back positive. My doctor told me there was sludge or a stone in my gall bladder and suggested I have it removed. I was referred to a surgeon who confirmed the diagnosis. But I wasn’t convinced. A gall stone only explained some of my symptoms. So I tried a holistic approach. For three months I changed my diet and took gall cleansing supplements without any relief. The pain increased. Seeing no other option, I scheduled the surgery and had my gall bladder removed. The sharp pains were gone, but not the shortness of breath, dizziness, fatigue, and heart palpitations. This is when I asked for a new doctor, my third. He was skeptical when I first saw him, but ordered a slew of tests to pacify my insistent requests. Tubes were filled with blood and sent off to the lab. Weeks later, I visited the doctor again for results and was referred to another specialist because I had an elevated enzyme in my liver which suggested hepatitis. Really? Hepatitis? The specialist asked some very personal questions and ordered another series of tests. Years after my first visit to the doctor, the results were in. No, I did not have hepatitis, but I did test positive for Genetic Hemochromatosis. Genetic hemochromatosis is disease which alters the body’s ability to regulate iron absorption. Too much iron is absorbed and stored in the organs and tissues, particularly the skin, heart, liver, pancreas, and joints. The excess iron poisons the organs and causes organ failure if untreated. The excess iron and iron carrying proteins, mainly ferritin, also thickens the blood so that organs have to work harder to process the blood. The potential for stroke is a serious side-effect. In my case, the gall bladder was the first casualty. How lucky I am that it was my gall bladder that failed first. A nurse shared the story of a recent patient who had lost two brothers to hemochromatosis before he had been diagnosed with the disease. The tragedy is that hemochromatosis is a very common genetic disease and is easily treatable. So why is it so often missed? The inherent problem with genetic hemochromatosis is that the disease hides like a cloaked ninja deceiving observers and masking its identity. 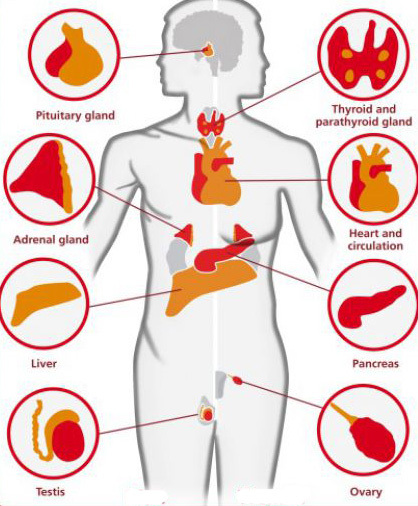 Symptoms are created by stressed organs, so these organs are treated. The iron continues to increase until the next organ is affected. The patient then goes to the doctor with these symptoms and receives treatment for that organ, not the underlying cause. It is only a matter of time before a critical organ fails. Treatment for hemochromatosis is simple. The patient goes on a weekly basis for a phlebotomy where blood is withdrawn from the body to (1) dispose of excess iron and ferritin and (2) so the body will use iron to make new blood. It can take months to drop iron and ferritin levels to normal. In my case, ferritin started at 3,700 ng/ml (200-300 ng/ml is normal). After two months, I am at 570 ng/ml. Only one or two more to go! Then, I’ll have to have my blood tested a couple of times a year and repeat the phlebotomy as necessary. My health has yet to return to normal. The biggest issue I face is the excess weight that I have gained. The good news is I have more energy now and should begin to see the benefits of routine exercise. I have also found that my personality has been altered by the illness. I have all the side effects of depression and a type-A personality. I know it will take some time. Seriously! It’s been years in the making – these bad habits and thinking patterns that have come to rule my life. But I have found the silver lining and am making progress. I hope you will read and share this with your friends and family. 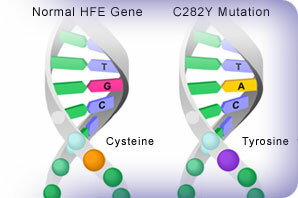 Genetic hemochratosis is the most common deadly genetic disease, a silent killer that can lie dormant in your genes and be passed on to your children even if you have no symptoms. And it is so easy to test for if you ask for it. One simple blood test is all it takes. I am thankful that I was insistent with my doctors that something was wrong. I have been given a second chance on life. God willing I’ll be able to make the most of it! James, I’m so sorry you have had to go through this. I’m still trying to figure out my chronic fatigue, weight gain and pain. I have thought for a long time it was my thyroid, but after my last tests I’m wondering if I need to have other things checked now. Thanks for sharing your story. Thank you for sharing. I was diagnosed with hemochromatosis mid-30’s, with multiple low-grade symptoms. And I’m a woman! It took me almost 10 months to de-iron, it depends on how aggressively your Dr. takes it. Don’t worry about the weight loss, your metabolism will kick back into gear without the excess iron to struggle with. I’ve lost over 50 lbs in 1.5 years and my liver function is back to normal. James, I’m so sorry you’ve been going through this. I had no idea. What a horrible last few years, yet you continued with volleyball, etc. You are strong, intelligent, and persistent. Your strength will get you back to your old self. I hope you feel better sooner than you could even hope for. That’s what I’ll pray for. Remember to lean on God, He should carry this burden, not you.